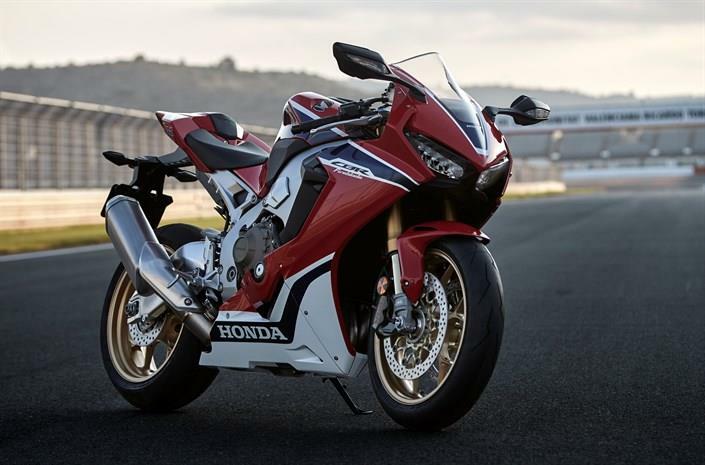 ﻿ MCN Fleet: How special is the 2017 Fireblade SP? Twenty five years ago, give or take a week, I was handed the key to the first Honda Fireblade into the country. For those pre-internet times, the hype around the bike had been borderline hysterical and the scramble by the bike press to secure that all-important first go on UK roads quite unprecedented, certainly in my time as a bike tester. I stood back as magazine editors bashed heads and bargained and begged with Honda, yet somehow the key for a bike that was about to change everything forever flew out of the melee and into my lap. It was the less lusted after black and grey Blade, but still it was radically beautiful. I had never seen such a blend of outrageous minimalism and sumptuosity on a road going motorcycle. Honda had removed at least 50% of the clutter we were used to on road bikes; it was packaged and engineered to a standard I barely understood. Simply pushing it off its sidestand revealed a bike so light it surely lacked any engine internals at all. Then for the next 36 hours it blew my mullet into the next county. Amazing. Not just faster and more energised than anything else (including the RC30) but more precise too, despite that dodgy 16-inch front wheel. Because it was a Honda, there was also a legitimacy about its flightiness and wheelies: it delivered sensible, grown up lunacy with proper storage under the pillion seat. Even though I was riding to a new degree of stupidity it felt, somehow, perfectly acceptable. Honda had it all covered -- even the headlights were brilliant. I’ve not experienced a moment like it again. For me, virtually every Japanese superbike that followed was essentially a copy. Often brilliant, but a copy. The 92 Blade looked and felt like Honda put everything into that bike – all of its values as well as its engineering – and the only way you can get that today is to buy a £146,000 RCV. Or is it? There’s something about the new Blade, especially the SP version that’s currently on its way to MCN, that triggers the same excitement as the CBR of 1992. It looks as proud and gorgeous as a 1990s Honda – engineered not to be clever or to prove some technological point – but simply to be brilliantly fast.